Author Sighting in the Raider Library! 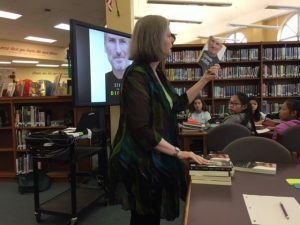 On September 22, award-winning author Karen Blumenthal visited HPMS to speak to Ms. Taliafarro’s and Ms. Callahan’s 7th grade block ELA class. Longtime journalist and young adult nonfiction author, Ms. Blumenthal provided the Raiders with excellent tips on writing engaging narrative nonfiction. If you haven’t already, check out some of Ms. Blumenthal’s books from the library. Other writers who write intriguing nonfiction that you mighy enjoy include Steve Sheinkin, Candace Fleming, Nathan Hale, Phillip Hoose, and Deborah Hopkinson.